MOVIE SYNOPSIS: When investigative reporter Tintin buys a model ship at an outdoor market, it sparks a journey that includes an ocean ride on a cargo ship, a plane crash in North Africa, and a sunken treasure at the bottom of the sea. Ever-present is Tintin’s resourceful dog Snowy and an unquenchable thirst for adventure. Violence/Gore. Fair amount for a family movie, including guns, explosions, swords, razors, and fires that put the main characters in peril. People are threatened, shot, punched and chased, and there’s even some blood when a secondary character dies by gunshot; he leaves a clue by marking letters in blood on a newspaper headline. One of the more intense moments occurs when an unconscious Tintin nearly gets his head cut off in an airplane propeller after crash-landing in the desert. Drugs/Alcohol: Captain Haddock drinks whiskey, slurs words, and acts tipsy through most of the movie. Shipmates drink, and alcohol is served at a fancy party. While their plane is falling from the sky, Haddock and Snowy drink blobs of floating alcohol in zero gravity. Which Kids Will Like It? Kids 8 and older who’ve read Herge’s Tintin books or like action movies a la Indiana Jones. Will Parents Like It? Yes, it’s a little violent for a PG movie, but also fun, joyful and well made. MOVIE REVIEW: What a fun movie! I haven’t read the comic books by Belgian author Herge (a.k.a. Georges Remi) on which The Adventures of Tintin is based, but no matter. It’s an action-packed caper with smart dialogue and great character development, despite the motion-capture animation. It will also bring Herge’s wonderful stories to a whole new audience unfamiliar with his work. At first, I wondered about the wisdom of using motion capture, but learned that director Steven Spielberg had originally planned to do a live-action adaptation and called Peter Jackson to ask if his visual effects company, Weta Digital, would work on the film. Turns out that Jackson, who produced the movie along with Spielberg and Kathleen Kennedy, was a longtime fan of Tintin. He convinced Spielberg that motion capture was the best way of representing Hergé’s world of Tintin. However, Tintin’s brave and resourceful dog Snowy would still be CGI. The movie also pays homage to Herge in the noir-themed opening credits, which are done in the same typeface as the comic books. It’s nice when filmmakers pay attention to those important details so that the original creators and authors don’t get lost in the process. I’d expect nothing less of Spielberg, who’s had the rights to Tintin since 1983. He’s been thinking about this film for a long time, and two sequels are already in the works. The story begins in Brussels with well-known investigative reporter Tintin (voiced by Jamie Bell) buying a replica of a legendary pirate ship called the Unicorn at an outdoor market. He’s immediately approached by a buyer named Ivan Ivanovitch Sakharine (Daniel Craig) who won’t take no for an answer. Unfortunately, “no’ is the answer he gets from Tintin, who takes the ship home and ends up being kidnapped – along with his brave and resourceful dog Snowy – and placed aboard a cargo ship helmed by the whiskey-loving Captain Haddock (Andy Serkis). Tintin and Snowy escape, but learn that Sakharine is after some hidden scrolls leading to a sunken treasure buried by Haddock’s ancestor, Sir Francis Haddock. The race is on as Tintin, Haddock and Sakharine race to find the final scroll and, ultimately, the treasure. When a movie is made by Spielberg and Jackson, the details are nothing less than magnificent. You can tell at a glance that a lot of time and thought has gone into making this movie, and it’s not lost on audiences — from details like a Citroen car to a vintage motorcycle with a sidecar (a Knucklehead Harley-Davidson, perhaps?). Even though Tintin is technically a kids’ movie, it’s also perfect for adults who love Herge or 1930s adventure flicks. There’s a fair amount of violence for a family movie, but it’s Indiana Jones-type violence that’s integral to the story and not gratuitous in any way. Another similarity to Indiana Jones is that Tintin is highly resourceful and only falters in his mission at one point in the story. He has that “improvise, adapt and survive” motto of the Marines down pat. 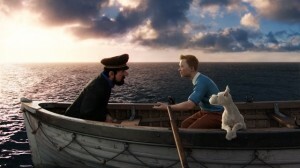 If you’ve been missing a good old-fashioned adventure film out of Hollywood, go see The Adventures of Tintin. Oh, and take the kids along. They’ll enjoy it, too. Two Reels – Coulda been a contender. 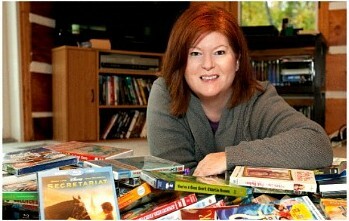 Jane Boursaw is a family entertainment writer specializing in movies and TV. Visit her at ReelLifeWithJane; follow her on Twitter; become a friend on Facebook; email jboursaw@charter.net.